This PDF 1.5 document has been generated by Conv2pdf.com, and has been sent on pdf-archive.com on 17/04/2015 at 15:13, from IP address 89.88.x.x. The current document download page has been viewed 244 times. File size: 292 KB (5 pages). whatsoever and to the exclusion of any other document. the final and binding purchase order. Service Provider becomes aware of the condition. these Terms of Sale at a later date. based on the documents to be translated or information provided by the Client. the Statistics function in Microsoft Word. beyond the services usually provided by the Service Provider. expressing this clear acceptance by return electronic mail. right not to commence work on the project concerned. means stipulated above, the quote shall be considered null and void. Service Provider reserves the right not to commence work. only for the service to which they apply. services shall be invoiced at the base rate usually billed by the Service Provider. valid proof that the order was confirmed. shall begin only once the payment has cleared. if the translation does not conform to the Client's standards or if delivery is late. Service Provider in writing of any disagreement concerning the quality of the translation. made. The client agrees to consider postal or electronic mail receipts as proof of delivery. to use to ensure the confidentiality of any sensitive information. parties and may result in additional fees. majeure or fax transmission, electronic mail, postal and other problems. the right to correct these aspects in cooperation with the Client. proofread them before the document goes to print. later than 30 days from the date of invoice. the quote or be billed to the Client. held solely liable for any harm or financial consequences resulting from the Client's negligence. 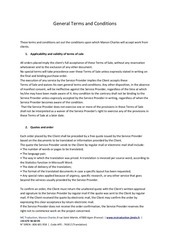 Provider the full contract sum for the work completed. 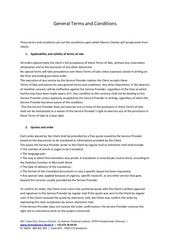 agree to attempt to settle the complaint or dispute amicably as follows. matter amicably and shall justify the payment to the other party of Euro 1,500. This file has been shared by a user of PDF Archive. Document ID: 00221494.